Tonight the results of the 2015 Louis Roederer International Wine Writers' Awards were announced in London. Although congratulations to the winners are in order, the awards have become tainted and inappropriate by the actions of the CIVC in their relentless legal pursuit of Jayne Powell (Champagne Jayne) – a communicator – writer, broadcaster etc. and ironically a great champion of Champagne. If this is how Champagne behaves towards its friends .... what about its competitors....?! 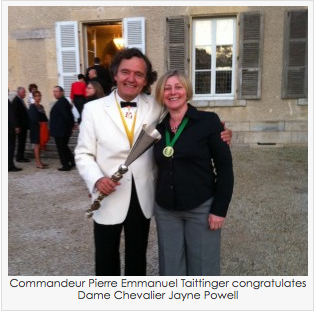 I was kindly invited to the announcement of the 2015 winners but declined as, given Jayne Powell's shocking treatment I have no wish to attend Champagne events. Equally my winedrinking diet remains Champagne-free, which is no great hardship as there are plenty of other good sparkling wines to enjoy. Here is an excellent blog post on Champagne Jayne by Anthony Rose. Very unfortunately the CIVC's appalling behaviour has been compounded by the disgraceful delay in Justice Jonathon Beach coming up with his verdict. Jayne and the CIVC were last in the Melbourne Federal Court on 13th April 2015 and still Justice Beach is silent. In the meantime, of course, Jayne Powell's business is essentially on hold. Scant justice here!